Leaders of the House Energy and Commerce Committee said they are investigating how effectively U.S. EPA regulates the export of electronic waste (e-waste), following several reports documenting inadequate controls and the harmful effects of sending toxic materials to developing countries. Committee Chairman John Dingell (D-Mich.) and others wrote a letter to EPA Administrator Stephen Johnson expressing concern that the agency has failed to prevent companies from exporting e-waste overseas where it most often ends up in poorly regulated countries where it is mishandled and wreaks havoc with human and environmental health. CRTs each contain between 4 and 8 pounds of lead, according to the Electronics TakeBack Coalition, who claim that about 40 percent of the lead, mercury and cadmium in landfills comes from old electronic equipment. A "60 Minutes" investigative report this month revealed that even recycling programs in the United States that claim not to send electronics overseas sometimes do. 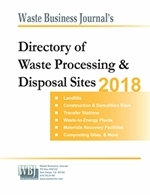 A Government Accountability Office report this year accused the EPA of not only failing to prevent e-waste exports to developing countries, but also of not even being able to identify the destinations of 80 percent of exported material; not surprising without a national plan and strategy. 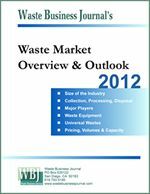 Waste Connections warned that the downturn in the markets for recycled commodities is likely compromise fourth quarter financial performance. "The precipitous drop in recycled commodity values over the past few weeks is unprecedented," CEO Ronald J. Mittelstaedt said Nov. 24. "Many of these commodities generated on the West Coast are shipped to Asia, where demand has dried up. In certain of our markets, recycled commodities that had a strong value only a few weeks ago now have no buyers," he said. "Until demand from Asia re-emerges, a commodity that historically has had value could remain a cost." The company now forecasts fourth quarter 2008 revenue to be between $264 million and $267 million based upon current market conditions and assuming no recovery in recycled commodity prices.